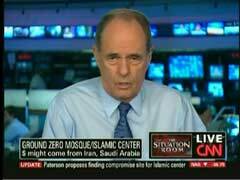 On Thursday's Situation Room, CNN's Jack Cafferty questioned the motives of the planners behind the proposed New York City mosque near Ground Zero: "The developer... has said the proximity of the planned mosque and center is not an issue. Really?...It's simply unrealistic to think you can build a Muslim house of worship two blocks from where this awful thing happened, and not get a negative reaction." Cafferty raised the mosque controversy during his 5 pm Eastern hour commentary: "Sometimes no answer can be an answer. When asked if a portion of the $100 million needed to build the mosque and Islamic community center near Ground Zero here in New York City might come from either Saudi Arabia or Iran, the developers refused to comment. This only adds to the already heated controversy surrounding this project." The CNN personality, after noting that "15 of the 19 hijackers responsible for the deaths of nearly 3,000 people, and the destruction of the World Trade Center on September the 11th, came from Saudi Arabia, and the U.S. considers Iran to be a sponsor of terrorism," applauded New York Governor David Paterson's effort to find a compromise over the planned mosque's site, labeling him "one of the few rational voices in the conversation." On Sunday's Newsroom, CNN's Don Lemon conducted a softball interview of the Rev. Al Sharpton and helped him forward the theory that the congressional ethics investigations into Representatives Charlie Rangel and Maxine Waters are being conducted because they are black. Lemon also didn't go into much detail as to what the charges against the two were and what were the circumstances of their cases. The anchor interviewed the liberal minister 12 minutes into the 6 pm Eastern hour. Before introducing Sharpton, Lemon did mention that Congressman Rangel was "accused of violating 13 House Rules" and that the "accusations range from financial wrongdoing to damaging the credibility of Congress," but never mentioned during the segment that the charges mainly involve rental properties the New York representatives owns in his district and in the Dominican Republic. He also noted that Rep. Waters "has chosen to face a House ethics trial related to claims involving federal aid to a bank with ties to both Waters and her husband" but didn't give additional details about that case. Lemon then set up his topic of discussion with the reverend: "Now, the investigation of such powerful people, like Rangel and Maxine Waters, have a lot of people talking. The reaction in Washington seems to be centered on whether the two House members are guilty or not, but back home, in their respective districts, some of their constituents aren't so sure justice is being done, and some are openly questioning why two high profile African-American House members are coming under such tough scrutiny." 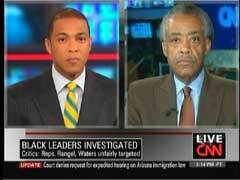 He then asked Sharpton, "Do you think that black members are being targeted unfairly by the Ethics Committee?" Has Joy Behar run out of things to talk about? Is the HLN host and "The View" co-host allowing producers to select her topics? On HLN's March 10 "The Joy Behar Show," Behar suggested it might be time for conservative talk show host Rush Limbaugh to go after making certain remarks involving embattled New York Gov. David Paterson and former Rep. Eric Massa, D-N.Y.
"This whole Massa controversy gave him an excuse to make a racial slur against New York Governor David Paterson," Behar said. "Not that Rush needs an excuse to make a racial slur." The comments that offended Behar involved Limbaugh saying Paterson was going to be a "Massa," a double entendre Behar asserted was racist. CNN.com's coverage of the failed gay marriage bill in the state of New York was predictably slated against conservatives on the issue. The article cited liberals against conservatives 4-to-1 and included an unchallenged quote that most states banning gay marriage "at one time or another sold blacks into slavery." The piece came on the heels of a vote in the New York Senate Wednesday over a bill that would have granted marriages to gay couples. Eight Democrats defected from their liberal peers to kill the bill, 38-24. During a wide-ranging interview with Bill Clinton, on Tuesday's "Today" show, about his Clinton Initiative summit, NBC's Matt Lauer wanted to get the former President's advice on whether current New York Governor David Paterson should run again. Lauer, seemingly concerned about the GOP capturing the governorship in New York state, asked Clinton if the unpopular Democrat's reelection bid might "hurt the Democratic Party." 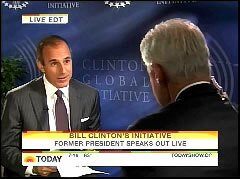 MATT LAUER: Real, real quickly, if you can. You're in New York. The governor here is embattled. His, his popularity ratings are anemic. The White House has suggested he should step aside, he should not run for election next year. New York. Gov. David Paterson infuriated Team Obama Friday by suggesting on a radio show that the president would be the next "victim" of a racially biased news media – based on an interview Paterson had with a black reporter, Dominic Carter of the local cable news channel NY1. 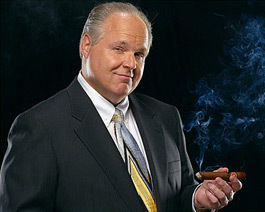 It's been all over the news - Rush Limbaugh packing up camp and abandoning his operations in New York City. It's been the subject of a Jon Stewart "The Daily Show" tirade and even drew the attention of New York Gov. David Paterson. Limbaugh appeared on Fox News Channel's April 8 "Your World with Neil Cavuto" and explained why he was leaving and how he felt about those that were glad he was leaving. "Well, if they're glad I'm leaving, Neil, then I assume that the governor of New York, the unelected governor - has no interest in the tax revenue he collects from me, in which case I would ask him to call off his audit dogs," Limbaugh said. "You know, one thing that hasn't been reported in this and I've mentioned it each time I've talked about stopping doing business in New York is I left New York as a resident in 1997. I moved down here to Florida, and I have been audited every year. This has been going on since '97. This is 12 years that I have been audited. The most recent audit is for the last three years. It's been going on since October." The budget put together in Albany by New York State lawmakers, packed with skyrocketing tax increases and new taxes, appears to have picked up some casualties two days before it goes into effect. The casualties are the coffers of the Empire State and the Big Apple, which will not be collecting anticipated tax revenue from talk king Rush Limbaugh very much longer. ..... Now, remember Mayor Bloomberg, who opposed this at one point -- I don't know where he stands on it now, but Mayor Bloomberg way back -- said (summarized), "Look, we got eight million people that live here, there are 40 or 50,000 taxpayers -- families, what have you -- that pay so much in tax that they essentially support the city -- and if they start to leave, we've got a big problem." He said, "Even if 5,000 of them leave, we've got a huge problem. We just can't run out there and keep raising taxes on the rich." The governor, Mr. Paterson, didn't hear him. "It's not just people earning over $500,000 a year that are going to get hit. A lower-tier tax increase would increase taxes by 14-1/2 percent for single people between 250 and $500,000 a year, and for married and joint filers earning 300,000 to 500,000. Taxpayers now hit the current top rate of 6.85% when their incomes reach $65,000. The Paterson plan would tax top-tier earners at 8.97%, the second-tier earners at 7.85%. .....There is no way Governor Paterson's going to raise $4 billion a year on this. Acting like Caroline Kennedy's PR flack NBC's Andrea Mitchell, on Monday's "Today" show, first delivered the news that the Kennedy family was "furious," at the way her Senate bid was treated by New York Governor David Paterson, but then she quickly merged her own personal opinion into the story, calling the smearing of the former First Daughter, "inexcusable." Curiously Mitchell never revealed to viewers, what specifically Paterson or those close to Paterson had said of Kennedy, only vaguely mentioning "they went after her on personal issues." MATT LAUER: While Caroline Kennedy's Senate bid crashed and burned some Democrats are burning at the way New York's governor handled the whole affair. NBC's Andrea Mitchell is in Washington. Andrea, good morning to you. 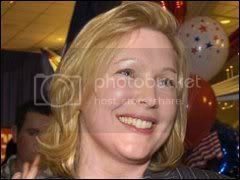 The decision by New York Governor David Paterson to name a somewhat conservative replacement (by that state's democrat standards), Kirsten Gillibrand, to Hillary Clinton's U.S. Senate seat has already sent some liberals into a tizzy. They are upset over Gillibrand's support for the National Rifle Association as well as for extending the Bush tax cuts among the issues that disturb them. So when will the mainstream media begin labeling Gillibrand as a "Maverick Democrat?" Or is the "maverick" label applied by the MSM only to Republicans who are liberals or "moderates" (really meaning liberal)? The ostensible subject was Caroline Kennedy. But in the course of, you know, discussing Kennedy's foundering effort to, you know, be anointed senator, Mika Brzezinski said something of more enduring interest. The Morning Joe co-host provided a telling glimpse into the liberal mindset, as Brzezinski cast her vote for Big Mommy government. Host Joe Scarborough observed that New York Gov. David Paterson was letting Kennedy twist in the wind. Rather than spending his time taxing everything in sight, the guv would be better off appointing Caroline or someone else, so the new senator could hit the ground running once Hillary is confirmed as Secretary of State, opined Scarborough. That's when Mika made her pitch for taxes as a tool for reforming those not living the lifestyle approved by the latest member of the Lititz landed gentry.